Looks a lovely car and the Aeros really suit. Right, didn't notice. Anyway, dimensions are the same, so should be the problems with them. Some persons actually was wondering how could I drive car without tyres rubbing arches at every pothole. Makes me wonder if the option list was different for german market, or simply the usual flow of second hand parts makes the difference - I took them - set of five wheels - off heavily crashed B4 2.0 ABK. I know [I mentioned that earlier], but it seems to me in the pics that there are 195/65 - or am I wrong? Anyway, 205/50 has so low choice of tyres that I'll investigate compatibility first - together with 205/50 comes instrument cluster compatibility things [5% difference in circumference], also the car is lower and tyres are less ready to absorb bumps. What a shame that there is no place in B3 saloon to put in bigger rear arches - I guess in coupe it was achieved on rear seat occupant space, while B4 saloon/avant has different rear axle, suggesting longer wheelbase, making place for bigger arches. 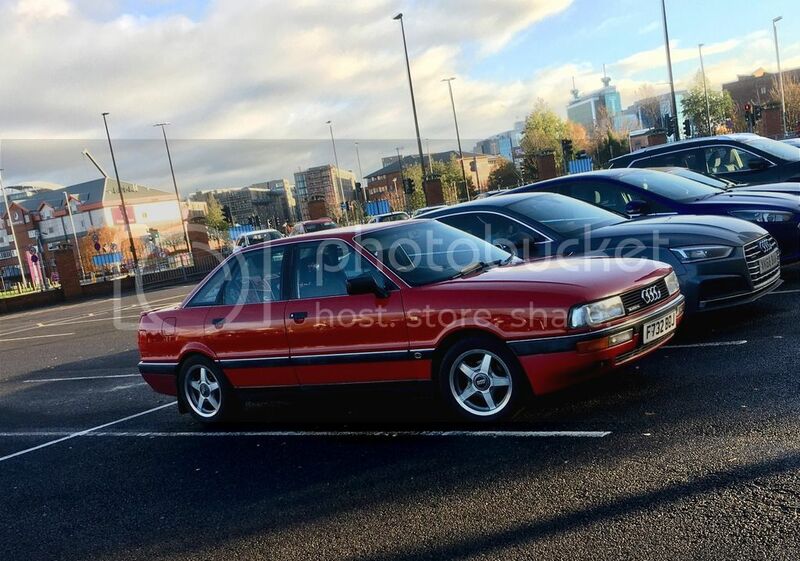 Anyway , thought I’d have a change , not saying I dislike the aeros, I do they’re superb , just fancied a change for a while, what du think classic audi people ? Each to their own. Not something I would fit to my car. As it happens, I've not long fitted my Ronals for winter. However, if you like them tha's all that really matters.